Nora is one of two play villages in the Explore universe. 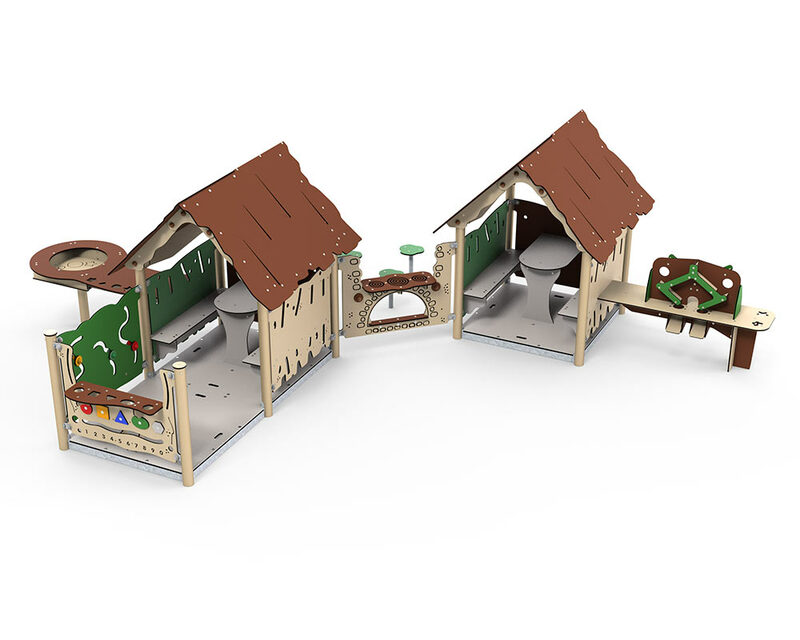 Here, the playhouses are combined to create larger play environments. The play village makes it possible to divide the play area into zones, so that lots of children can play together in different places around the playhouses without disturbing each other. The play villages are very practical at, for example, institutions, where the playhouses need to accommodate large numbers of children. Nora is a play village which is designed for many hours of creative fun and play. One of Nora’s playhouses is designed with a veranda and a kiosk panel, which is ideal for playing shop or another role-play. On the outside, you will find the insect panel, which tests children’s fine motor skills when they move the creatures around. Several children can play together with water and sand at the splash table, and in this way stimulate their sense of touch, fine motor skills and creativity. Fine motor skills are important for hand development and grip patterns, which are important when learning to write. At the second playhouse, there is a sand machine, which challenges both the children’s collaboration and creativity as they are required to fill up a bucket with sand. In between the playhouses is the play village’s stove, which inspires role-playing, for example kitchen, theatre, TV news or something else entirely. Both playhouses have a table and benches, where there is space to play or eat a packed lunch. The playhouse floors are designed with a specially developed non-slip cubit-grain surface, and so the playhouses do not require a safety surface, and can therefore stand on grass.